Landscape photographer Guy Tal reveals what he looks for in a scenery and how he creates fine art from it. PHOTOGRAPHER: My main interest is intimate landscape photography. Intimate in the sense that it reveals a personal connection with the land and the elements photographed, rather than relying on obvious attractions and grand scenes which are beautiful in their own right but do not necessarily represent my own unique impressions and sensibilities. I live in the heart of the Colorado Plateau, a scenic desert region covering much of Utah, Arizona, New Mexico and parts of Colorado. I fell in love with this place from the first day I set foot here. On occasion I contribute to magazines such as Popular Photography and Outdoor Photographer. I also sell my work for book covers, calendars, corporate interior decorators, and private collectors. In addition to photography I also write professionally, teach private workshops and offer motivational speaking engagements. In particular, I always enjoy speaking and presenting at camera clubs to help inspire photographers embrace their work as expressive and personal art rather than just a means of documenting their experiences. PHOTOGRILL: Why did you make this photo? PHOTOGRAPHER: It was a personal project. 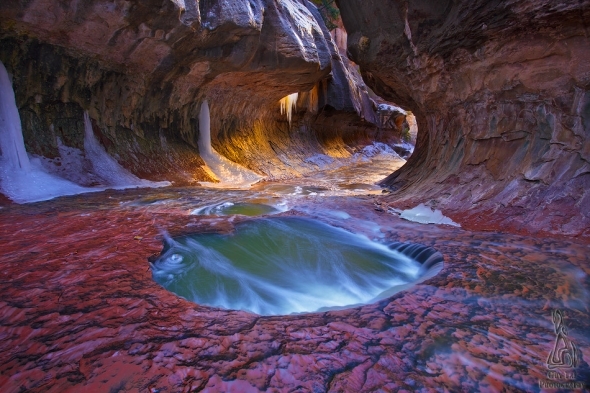 The image was made in the famous Subway in Zion National Park. The hike is about ten miles long and requires some steep scrambling to get into and out of the canyon. Until a few years ago, this place was seldom visited and the Park Service limited access to it to just a handful of people each day (requiring a permit). In those days it was unlikely that you will see another person there on any given day. However, due to its growing popularity, especially with photographers, the quota had been raised to 50 per day and it gets quite busy in the summer and autumn months. I went in there last October and found no less than eight photographers lined up to make copies of the most common iconic composition of the place. Someone actually yelled at me to get out of the way. This is not at all what I seek in a wilderness experience. I turned around and headed back. PHOTOGRILL: So you went back again make this photo? PHOTOGRAPHER: A couple of months later, in the midst of winter and after a few days of snow and below-freezing temperatures, I realized I will likely have the place to myself under those conditions. Of course a ten-mile hike in deep snow and icy water is not for the faint of heart. At the backcountry desk I spoke with the ranger as she was preparing my permit. She wanted to be sure I knew what I was doing. When I asked her how many permits they issue during the winter she just looked at me in silence for a moment and said “one, if that”. She told me that the previous week another party had to be evacuated from the canyon. 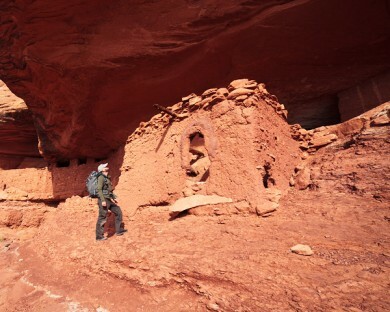 My plan was to arrive at the Subway at the best time of day for light entering the sandstone passage. I looked up the time for sunset, and calculated a turn-around time to make sure I was out of the canyon before dark. The hike was moderately difficult. The trail wasn’t visible under 1-2ft. of snow, and the canyon bottom is strewn with large boulders that required creative ways to get around. I finally made it to the Subway with only 15 minutes to work before my turn-around time. I then immediately turned around to make the 5-mile hike back to make sure I was out of the canyon before dark. As a general disclaimer, I would not recommend making this hike under these conditions to anyone other than very experienced hikers. I’ve been hiking and backpacking in these canyons for many years and was well prepared for emergencies. Many of the places I work in are very remote and require off-road driving to get to the trailheads (if there even is one) as well as some navigation and orienteering. I usually hike by myself and carry a satellite locator beacon for extreme emergencies, as well as make sure someone knows the general area where I plan to be and when I plan to come out. PHOTOGRILL: Can you describe your thinking process as you came upon this scene? PHOTOGRAPHER: A good composition is the strongest visual tool available to a photographer. Although many tout the importance of light, I always tell students that there is no such thing as “bad light”. There may be a bad light for a specific purpose, but if you know how to work creatively with what you have, you can always find compelling subjects that will make for successful images. In this case, I actually had my composition planned in advance as I’d photographed the place before. I also had only 15 minutes to work so I already had a good idea of the compositions I wanted before I got there. What I found particularly interesting about the place in winter, though, was the unusual colour palette. The red sandstone took on a different look under these conditions and the water was an interesting shade of yellow and emerald. The icicles were a unique and very interesting addition not usually seen in images of this place. PHOTOGRILL: You must have been standing in icy water to make the photo, it would have been freezing? PHOTOGRAPHER: Yes it was, and I knew it would be. I have hiked other “wet” canyons in winter many times and knew what I will need to stay comfortable. I had several layers of clothing, insulated winter hiking boots and gaiters to keep the snow out. I also knew the Subway itself will be very icy and slippery so I brought a pair of Yaktrax traction soles to attach to my boots once I got there. PHOTOGRILL: What were the technical details? PHOTOGRAPHER: With my usual disclaimer that none of these matter to the success of the image, which could have been made just as well with almost any other camera system: I used a Canon 5D Mark II, 14mm lens, 2.5 second exposure at f/16 and ISO 100. 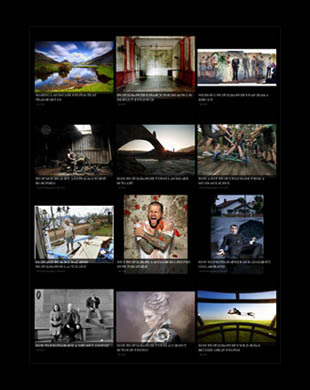 PHOTOGRILL: What drives you to make these photos? PHOTOGRAPHER: Although I love the practice of photography, my primary motivation is experiencing the wild. Being outdoors in remote locations under unique conditions and seeing some of the amazing beauty of our world is the reason I do what I do. Photography just happens to be the medium that’s best suited for me to work in, and share these experiences with others. To me it is every bit as valid as any other form of artistic expression. If I had been a painter with only 15 minutes to work in this location, these images may never have existed. PHOTOGRILL: What equipment and tools are important to your work? PHOTOGRAPHER: I use a wide variety of tools, including HDR and others. I believe in using them in moderation. Though I do strongly believe that processing is an important creative aspect of fine art photography. If all the photographer does is transport the camera and push buttons to make an image that anyone else in that position could have made, then what makes it art? Where there is no artist, there is no art. My advice to fellow photographers is always to get the best gear they can afford. This usually ends up saving money in the long run. That said, there’s no need to break the bank just to “one-up” anyone else or for bragging rights. Weight is important to me since I backpack quite a bit. I never carry a lot of gear on backpacking trips. I’ll usually have a couple of lightweight zooms. If conditions are very challenging I may carry only one general-purpose zoom, and if working from my car I usually have 4-5 lenses. PHOTOGRILL: What interesting things happen to you on your travels? PHOTOGRAPHER: Too many to mention! I do what I do for the experience first and the images second. I’ve been stranded on a high canyon rim in a lightning storm. I was chased by a bear. I witnessed an amazing mountain sunrise after a long hike only to realise I forgot to pack my camera, though I did have a tripod and lenses. And I have met some of the strangest characters you can imagine in some of the most unlikely places. More of Guy Tal’s images and writings can be found at his web site: guytal.com. He just released his new Creative Processing Techniques eBook, which is available at guytalbooks.com, and Guy can be found on Facebook and Twitter. This entry was posted on Tuesday, May 17th, 2011 at 4:04 pm. It is filed under The Grill and tagged with Landscape Photography, Nature Photo, Posts Tagged ‘Landmark Photo’. You can follow any responses to this entry through the RSS 2.0 feed. I do a lot of hiking in Arizona for my photography, so I’m familiar with the difficulties and dangers Guy mentioned. And even though you have to deal with sliding/falling down scree or into a creek, cactus spines, angry rattle snakes and the occasional Javelina, bear or mountain lion, it’s all worth it for a great image. It seems to me, the harder it is to get to a spot, the better the images are. and Thanks to Craig for posting this.